Abermar Guest House Inverness is run and owned by James and Allison Mackay who welcome you to their Guest House which lies in a quiet residential area only a short walking distance from the River Ness, Inverness Castle, Inverness Cathedral, Eden Court Theatre, bus & rail terminals and all local services. The bed and breakfast is a 7 minute walk from the vibrant City Centre of Inverness which offers an excellent selection of restaurants, pubs and hotels serving a variety of cuisine to suit all tastes and budgets all located within easy walking distance. The guest house also has an extensive private car park to the rear of the building. Each of the rooms in the B&B are individually decorated with en-suite bathrooms offering guests a friendly, family, home from home atmosphere where nothing is too much trouble to ensure the complete enjoyment of the stay. All rooms also boast LCD colour television, hairdryer and a hospitality tray. If we could give higher than 5/5 for cleanliness, friendliness and facilities we would. It is apparent this is more than just a business and there is 'love' in the attention to detail. an absolute perfect b&b and beautiful stay in the highlands! top clean and wonderful breakfast with an outstanding service. selfmade fruitsalat at its best. heartly welcome everytime and a warm family treatment. we come now for a lot of years and it seems to be better every time because the never stop to arrange their home as beautiful as possible for the guests. attraction: eilean donan castle,victorian market in inverness, tha castle of inverness, isle of the skye, fort william, highland monument and viaduct, test the burgers :) the dolphins, and last but not least the wonderful scottish people! We loved it! All very friendly! James and Allison are a very nice couple and there guest house is superb, we have been to Inverness several times and wouldn't think of staying anywhere else, breakfast is made fresh and free parking in a quiet location just a short walk to city centre, will be back next time in the area, thank you James and Allison for your hospitality. Fabulous, and the service was great! Thank you for a great stay! Really nice clean friendly place to stay. Very close to the town centre Good was excellent. Would recommend this a place to stay. Close to town without it being too noisy. Pleanty of bass and restaurants within walking distance. Lovely friendly hosts, spotlessly clean room with everything you could want plus little extra special touches to make your stay comfortable and easy. Great choice at breakfast and cooked option done to perfection. Cannot recommend this place highly enough it was just perfect. Book in advance for restaurants to save disappointment, Inverness is usually very busy and all popular places booked up. Excellent B&B for a short stay (4 nights) in Inverness. Welcoming hosts, excellent single room, very good breakfast...all one could hope for in a B&B. Ness Islands Walk - excellent! The rooms were nice and very clean. The rooms are well equipped. An the owners are really friendly and helpful. They accepted for us our baggages which were late and which were delivered there eventhough we arrived the next day. We are so thankful. 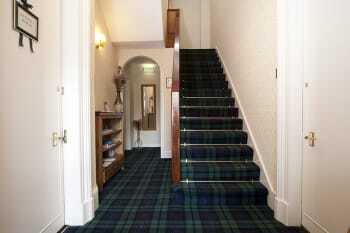 The guest house is located in an silent area but in a view minutes walk you are in the centre of Inverness. The restaurant near by the river ness are really expensive. James and Allison were so warm and welcoming! We had a wonderful stay and would highly recommend the Abermar Guest House to anyone visiting Inverness. We enjoyed The Kitchen and wished we could have tried its sister place, The Mustard Seed and also RocPool from what we heard about them. Not enough time... Walking into town from there was easy; it is a great location. Hosts were lovely! Room was huge, quiet and shower excellent! Was up one flight of stairs. Delicious breakfast. Location only 2 blocks from river and short walk to city center. Waterfront cafe and Riverfront House both excellent restaurants 2 blocks away! A friendly, cosy place to stay. Clean and well organised.A wee walk from the station, great to stretch the legs in fine weather after sitting down travelling. A very friendly stay in a comfortable home from home. Excellent spacious room and facilities. Spotlessly clean. Great breakfast and choices available. James and Allison are great hosts. A great bonus is having off street parking and good Wifi, a must for the seasoned business traveller. James & Allison are excellent proprietors very friendly. The breakfast is excellent also. A quiet street, less than 10mins walk & your into the city centre. Would highly recommend this b&b, well deserved gold award. The Ash, Bella Italia are good places to eat. You have the Eden Court Theatre, within walking distance where you can watch a show or a movie. You have a lot of shops also. There are also Loch Ness cruises & a visit to Urquhart Castle. Just along from the b&b is a quiet pub, which is good for a nightcap. Absolutely gorgeous bed and breakfast. Peaceful location with parking. Lovely comfortable bed, lovely extras and everything was well thought out - better than some 5* hotels we have stayed in. Hostess could not have been more helpful. Freshly prepared breakfast sourced locally, very enjoyable. Thoroughly enjoyed our croissants too. We would love to return for a visit. Lots of nice places to visit within easy reach. Plenty of hotels to choose from. Shops were lovely especially the Dornoch Stores and Cocoa Mountain. This is a fabulous place to stay as you explore Inverness and the surrounding area! The hosts have attended to every little detail and the breakfasts were wonderful and abundant with choices. Best ever guest house. Just a short strole to the city centre. Ample free parking. James and Alison were perfect hosts. We stayed for 3 days. Spotlessly clean, homely and welcoming. Breakfast was first class and the room was large and pleasant. Would gladly stay there again. Well located for trips to Urquart Castle and Loch Ness. Inverness has a massive choice of restaurants. If you like Chinese, Jimmy Chung's overlooking the River Ness has the best buffett you could wish for. Try the dolphin boat trip. I loved to stay to Abermar House. It was very good. The room is very good. And hosts were very good persons and it was good to talk with them. If I come back in Inverness, I come back in Abermar House. Muy bonito el paseo por la ladera del río en dirección contraria al mar. Excellent place to stay quite close to the centre and to the riverside walks, in a quiet residential street. The house is a lovely old Victorian villa, fitted out with all modern fitments and facilities. Great breakfast and friendly welcome. Recommended! If you want to try viewing dolphins leaping and you have a car, Chanonry Point is not very far from Inverness. Fort George is also a very impressive fortress to visit. Culloden battlefield is a must of course, in terms of Scottish history! We really enjoyed your hospitality and the excellent breakfast. We also submitted a Google review. We really liked dolphin watching at Fortrose and the Black Isle Brewery bar at Market Close, 68 Church St, Inverness IV1 1EN, UK. We all felt it was home from home. Very friendly and helpful. Lovely breakfast. This was the 6th time we visited Abermar Guesthouse and feels like home. Well done! we are looking forward to our next stay. Close to the city centre, the hosts are very helpful and will give you any information you need to make your stay that extra special. Alison and James were excellent hosts, very helpful with tourist information. Off street parking was provided. Lovely breakfast!! Day tour to Isle of Skye was fabulous, with Rabbies. Turkish restaurant named Aspendos, excellent food and service. James and Alison were both very welcoming and helpful with local information. The 4 for location is merely because the footbridge was closed, but I believe it will reopen very soon and then it would be 5, well within walking distance of pubs, restaurants and places of interest. Near city centre. Nice Staff & Breakfast. Abermar's location was ideal, just minutes to the river and all the restaurants etc. The owners were very friendly, accommodating and professional. We had a very good but unique experience at Sam's Indian restaurant on Church st. and I highly recommend Hootananny on Church st for a loud but fun dinner. Within easy walking distance of Inverness plus main tourist routes. Excellent breakfast especially the fresh fruit. Hosts very helpful & provided a fan as a very warm summer. Would certainly stay at Abermar again & recommend to friends & family. Very friendly & welcoming owners. Comfortable bed and excellent breakfast. 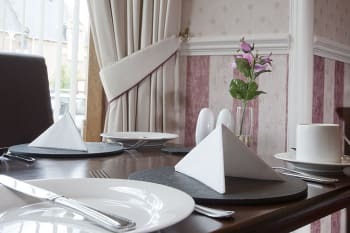 Property is immaculate throughout and I would have no hesitation in recommending Abermar guest house to future guests. Room 2 was very spacious. Modern bathroom and quality fittings. Breakfast was delicious in the lovely dining room. Close to town centre and river walks. James and Allison absolutely wonderful hosts - very welcoming and attentive. We thoroughly enjoyed at stay. lovely room with excellent breakfast. Only a short walk into town. Walk around the castle lots of good coffee shops & restaurants very friendly people. There is a book store in town Leakeys well worth a visit. The tourist office is excellent Hannah was very helpful and patient with our enquiries. Great room, everything was clean and comfortable. The breakfast was delicious. Good location to walk to the town, bars and restaurants within 5-10 min. Private parking. Great location, comfy bed, spacious room and very friendly staff/hosts. The breakfast was a bonus and very yummy! James and Allison are the best representation of Scottish Highland hospitality. We so enjoyed our time at Abermar, the occasions to chat with the owners, and their willingness to accommodate us. We would return to stay in their property "in a heart beat." We were able to walk or to "bus" most every place we chose though you have to time you departure and returns frequently on an hourly schedule. Restaurants are very busy during tourist times, so book as far in advance as you can. Takeaway is always an option. Very good host, breakfast is excellent, very clean room. And the shower is also very good. Very thouthful to email me that i was forgotten something. Go see the dolphins in rosemarkie Walks nearby the Urquart castel. Lovely clean comfortable rooms .Delicous breakfast .Very friendly service . Would highly recommend it to friends and family . We very much enjoyed our stay here. The staff were very friendly, and the breakfast was wonderful. A walk from Inverness Castle, via Ness Islands, and on to the botanic garden is well worth it. Travellers should know however that there isn’t a lot nearby that general area in terms of restaurants or supermarkets. James and Allison are excellent hosts. They were very welcoming when we arrived and when we returned for an additional night. They had many suggestions regarding things to do in the area and made our stay there especially pleasant. We loved the walk along the River Ness--try to do the entire walk and enjoy the lovely islands in the river. Local restaurant very good food excellent. We stayed, at the guesthouse, for two nights and for the fifth year in a row now. Absolutely no need to go searching for a better guesthouse as you won't find one. This is really creme de la creme. On walking distance from the city centre, located on a quiet road. Restaurants and shops very close by. Black Isle Bar has a great selection of beers and very tasty pizza. Perfect 4 nights stay for the third time in last 10 years and the same old story - very friendly hosts Allison and James, excellent cooked breakfast, freshly made fruit salad every morning, great choice of cereals, jams, marmalades...Very close to the town centre, spacious parking at the rear of the house, rooms are clean and big enough, good water pressure in bathrooms. Really enjoyed our stay at Abermar B&B. I was looking for a bit of comfort after spending A week in a campervan & wasn’t disappointed. The twin bedroom and ensuite bathroom were spacious, very well maintained and nicely decorated. The beds were extremely comfortable and the bathroom spotless. Breakfast was great and I enjoyed talking with the very friendly owners. It was the perfect end to our holiday. A very lovely place to stay. Alyson was very nice and helpful. Our room was very big and comfy. The bath room was also very satisfying and everything was clean. The breakfast was delicious, especially the fruitsalad. It's totally cool, that there is a private parking spot and the location is great. It's only a 10 minute walk to the city center. The Abermar Guest House is an absolute lovely place to stay. Our expectations were exceeded! Very friendly and hospitable owners keep their property in excellent level of cleanliness, rooms are equipped with comfy beads and have all amenities a traveler needs. Breakfast is freshly prepared each morning by the owners. Would definitely recommend a stay at Abermar Guest House. Abermar Guest House in Inverness is an excellent base and starting point for day trips around northern and western Scotland. Very happy with my two nights, no complaints whatsoever. I did 4 different day trips with Rabbit. They are very friendly and very nice.Isle of Skye is highly recommended. Great place to stay! Owners are very friendly and helpful. The room was great, bed super comfy, everything very clean. After a good nights rest - the area is rather quite, the city centre is just a 10 min walk away though - you can start your day with a great breakfast. Highly recommended! // Sehr gute Unterkunft. Die Inhaber sind sehr freundlich und hilfsbereit. 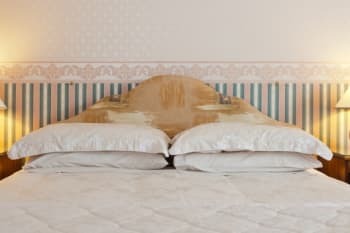 Das Zimmer war prima, bequemes Bett, sehr sauber. Nach einer erholsamen Nacht - die Gegend ist eher ruhig, obwohl das Stadtzentrum in 10 min zu Fuß erreichbar ist - kann man den Tag bei einem prima Frühstück starten. Sehr empfehlenswert! Have stayed several times. Friendly and helpful. Clean and comfortable. Excellent breakfast. Short walk to town centre. Waterfront restaurant very good. Well placed to visit historical sites e.g. Culloden, Castle Urquhart. Beautiful surrounding countryside for walking. Lovely family business. James and his wife will make you feel in your own home, frequently asking if we needed anything else. 5minutes walk to the city centre and with their own car parking. We will come back again! As always, this b&b is fantastic. Home from home for us. Welcoming and friendly staff. The room and toilet was extremely clean. Good quality thick cotton towels. Kettle in the room with tea and coffee available. Amazing cooked English breakfast. I felt very comfortable in the hotel. I will be happy to come back again. Travelling from Inverness to other towns is easy from the main bus station. The walk by the Ness river worth. Visit the little Nessy Islands. For food I recommend The Black Island Brewery, the Hootenany and Mustard Seed'. Simply exceptional in every way. Bustling music scene in Inverness. And of course the Whisky :-). Thank you for a lovely 3 night stay. You are both very good hosts. Your b&b is always immaculate. The breakfast is lovely with a good selection. A joy to stay. Eden Court is a short walking distance if you wish to watch a film etc. The city centre is less than 10 mins away. Lots of shops. There are boat trips to go on. We ate at the Royal Highland Hotel which is next to the train station lovely meals. They also do lovely cocktails. Another night we ate at the Bella Italia again a very enjoyable meal. A couple of minutes from the Abermar is a lovely quiet pub called the Thistle bar which I like as its quiet. You pass this when walking to the city centre. Another very pleasant stay at Abermar. James and Allison are such welcoming, friendly hosts. Met with a warm welcome, very comfortable and very clean. Lovely breakfast. Very centrally located. Car park a bonus.value for money. Would definitely recommend Abermar for an Inverness stay. Owners friendly and helpful. lovely, warm, good food and great hosts. Friendly and helpful owners. Provided a lovely hearty breakfast with lovely seasonal fruit and full Scottish breakfast. Room was very clean and spacious. Very friendly and helpful staff, made us feel at home. Lunch at the Mustard Seed was very good and relatively cheap. Very convenient location. A short walk across the bridge will take you into the heart of Inverness city centre with a good choice of shops, restaurants etc. If you must use a car, parking at the Eastgate multi-storey facility will only cost you £2.50 for four hours. Good value by anyone's standards. Great 1 night stop over, comfortable bed. Must visit Plockton, donarch and Nair! Very enjoyable stay. Thank you for your hospitality and your kind support whenever requested! Nice and tidy rooms and the breakfast was superbe aswell. Whenever we stay in Inverness we will be happy to visit again. We where very happy with everything and are considering returning. It is really close to the center of the city. A few minutes walk. Very warm welcome even though we were late due to a delayed train. Friendly and helpful. A fantastic place to stay in a excellent location. Our room was spotless, the bathroom was modern and clean with a fantastic shower. The breakfast was delicious with loads of choice. I would recommend anyone visiting Inverness to stay here. There are loads of great bars and restaurants within walking distance. Thank you for a lovely welcome and great breakfast. A comfortable, friendly environment, well run by Mr & Mrs MacKay, who know how to make guests feel welcome. Great room. Brilliant breakfast. Friendly and helpful staff. Comfy bed, Wifi, tea and biscuits provided. Off street parking is also an added bonus. Lovely hosts, they were helpful and chatty. Breakfast was fantastic and never rushed. We enjoyed ourselves and would return. Good location for walking around Inverness. We had a nice stay, lovely welcome and we are looking forward to see you again. City Center just a few minutes to go, nice restaurants and shops there. Beautyful atmosphere in the City. Fantastic, everything about this b&b is good. Clean, warm welcome from James and Allison, splendid breakfast, will certainly be back. Excellent breakfast, comfortable room, friendly welcome, helpful information re walks, restaurants, buses. Easy walk from city centre. Quiet location. Close to both the river and the Caledonian canal. Try Eden Court arts centre and cinema. Can recommend Riverside restaurant. Castle Gallery has great range of beautiful arts and crafts. River Ness and the Caledonian Canal are both beautiful places to walk. I USE THE ABERMAR GUEST HOUSE REGULARLY FOR BUSINESS TRIPS, JAMES AND ALISON COULD NOT BE MORE ACCOMMODATING, BREAKFAST IS EXCELLENT AND THE ROOMS ARE SPOTLESS AND WELL SERVICED WITH EVERYTHING A GUEST WOULD EXPECT AND MORE THAN SOME TOP HOTELS I HAVE STAYED IN. I GUARANTEE YOU SHALL NOT BE DISAPPOINTED. It's a beautiful house and the owners are very kind. They serve a complete breakfast. Inverness is a good place to do guided tours around Highlands area. The guest house is situated at 5 minutes from the town center, is located in a very calm place, the breakfast is diverse and delicious and the owners are very helpfull. Mind the dinner times, specially if you are from the south. From 17:00 to 21:00. Professional, efficient service. Exactly what a B & B should be. The Waterfront Pub/Restaurant is a good venue. Nothing fancy, just honest-to-goodness good food and beer in a relaxed atmosphere. Eastgate Shopping Centre has a varied selection of shops to suit all tastes. Very clean and friendly, the room is so lovely, breakfast is incredible rich. James and Allison prepare fresh fruit and Scottish breakfast, they really love all the guest and hospitable. Wonderful place, easy to reach, comfortable room with private bathroom. The owner are kind, friendly, ready to help. Breakfast is delicious and with plenty choices. I will sure suggest this b&b to friends and come back here on my next time in Scotland. Could not be bettered anywhere. We had a very nice stay in the Abermar Guest House. Allison and James did a really great job! They do care about their guests and run this guest house with lots of love! Allison and James are lovely hosts and very helpful. We've stayed here before and the rooms are always clean and freshly decorated. The breakfast is one of the best. Seek out the lesser known restaurants in Inverness. There are many that are just a block off the main streets and well worth it. Sehr gut gelegen, ruhig und doch nur wenige Gehminuten vom Zentrum. Perfect hosts with perfect facilities close to the city centre. Could not be better. Don`t miss Dunrobin Castle or viewing the dolphins from Fort George. Just walk over the bridge and lots of lovely restaurants My husband and I visited Fort George and also Culloden. We had a lovely stay and enjoyed our visit very much. The room was well equipped and the cleanliness was flawless throughout. We also appreciated the off-street parking since roads in the area are quite narrow. Allison and James are great hosts! Definitely walk along the river to the Ness Islands. Another highlight outside Inverness is Cawdor Castle with beautiful gardens and nature trails. Extremely helpful and polite owners! Very helpful with information. Quiet en very clean rooms and to a very high standard. Highly recommended for visiting Inverness and surrounding area's. This Guest House deserves another 4th Gold Star! There is enough information, in your room, about things to see and do in the area. Very friendly and helpful hosts. Would not hesitate to stay here again and recommend to anyone going to stay in Inverness. Walk along the River Ness to Ness islands. Well worth a visit, its lovely there. Our hosts were warm, friendly and were very helpful with details for visiting and getting around Inverness. One of the best I have experienced! Thank you so much James and Allison! Very friendly and helpful hosts, excellent breakfast and accommodation. Advise to book for dinner in advance as difficult to find places with availability at short notice. The breakfast was very nice and our room was spacious and comfortable. We greatly appreciated the suggestions of things to do in the area (walk to Ness Islands and the Highland Folk Museum). We look forward to staying with you again when we are in Inverness. This B&B is excellent in every way. No more to say. Will certainly be back. At busy times it is advisable to book a restaurant well ahead for your evening meal. Loved the Nessie trip and The Mustard seed restaurant is great and particularly good value is the lunchtime menu. Enjoyed our stay. Couldn't be better. Lovely friendly hosts. Loved everything about it. Our hosts were wonderful. Will recommend to friends. Excellent rooms, spotlessly clean, great breakfast, very pleasant, helpful owner, short walk from city centre, very reasonable price. Abermar is everything you would want from a guest house. It is spotlessly clean, the breakfasts were excellent and Alison and James are friendly and helpful. Hospitality as it should be! There are many eating places in Inverness but the fish and chip shop in Young Street is worth a visit. A visit to the newly opened viewpoint at the top of the castle gives excellent views of Inverness and surrounding area. Buon numero di locali (pub,ristoranti) Inverness è stata una sorpresa, in positivo. Lovely accommodation, very high standard, owners were very helpful, very clear about everything and nothing too much trouble. If I plan to visit Inverness again I would contact them first for accommodation. Spacious room, modern bathroom, friendly & helpful owners, good breakfast - a great place to stay! Lovely hosts. They explain what to do in Inverness with a map. Room is exquisitely clean and adequate. Great breakfast. Inverness is full of entertainment venues. The famous Loch Ness is nearby for activities. Des hôtes charmants vous accueillent à proximité du centre ville. La chambre est parfaitement équipée, très silencieuse, la literie est de qualité. Le petit déjeuner est très copieux. We had the most pleasant stay at Abermar. The owners were wonderful, very friendly and helpful. The location is really perfect, its a beautiful walk to city centre and the neighborhood is charming. The room was large and the beds were comfortable, we didn't want to leave! Also, the breakfast was delicious! Thank you and we hope to come back again! Pluddo falls was a beautiful hike. Zizzi's italian restaurant was very good!! We visited twice in one week due to touring, we had a very warm welcome both times, the room was a good size and very well equipped. The breakfast was well prepared and most enjoyable, the owners couldn't have been more helpfull. We plan to return to Inverness and hope to be able to return to Abermar again. We would highly recommend No 27 pub/restaurant, across the road from the castle. The service was friendly and the food delicious. Out of all the accommodations we stayed at during our weeks holiday in Scotland yours had the most homely feel. It gave us the sense of home away from home. Would never hesitate to recommend you to all we know. We had dinner at "kitchen brasserie" near the river Ness. It is a very good adress for everything. Lovely spacious room and good breakfast. Lovely family room with tea and cake in room with lots of choice. Great breakfast! Lovely greeting on arrival. Very friendly. Good to have off road parking at rear of building. Lovely room and very comfortable bed. Great breakfast choice. Good location for travelling around area. Lots of nice local restaurants. Culloden House Hotel is lovely for a meal. Excellent food beautifully presented. Lots of local history - visit Fort George, castles, Culloden battlefield,cruise Loch Ness, etc, etc. Stayed for work purposes but would gladly stay for a short break also. Friendly reception (fresh milk offered for tea on arrival), nothing too much trouble. 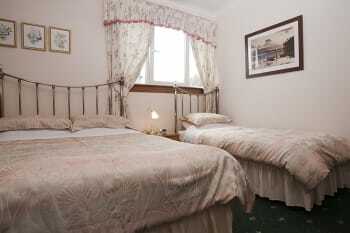 Excellent breakfast, very clean rooms, good showers, child friendly, good private parking. Walk straight down the road to experience the bouncy footbridge over the River Ness for the quickest (and most fun) way to the city centre. Lovely clean accommodation and great breakfast. Have done already. Put your card in my work tea room and told all the ladies about your lovely Guest House. Not for the first time at this place. Excellent! Have just returned from another perfect stay. We cannot find fault with any aspect of Abermar Guest House. You are made very welcome by the owners ( James and Alison ) who are very friendly and professional. We have stayed in various bedrooms and all the beds are very comfortable and cosy, a home from home. The cleanliness in all areas is impeccable and the breakfasts are plentiful and tasty. Since finding the Abermar, we wouldn't stay anywhere else in Inverness. Very central, only about 5 minutes walking distance over the suspension bridge brings you to all the shops and restaurants. There are numerous interesting places to visit. Here are a few examples. The excellent leisure centre with with the gymnasium and brilliant multi level swimming pool. The Ness Islands and the three golf courses are also there to be enjoyed. We have been staying at Abermar for 8/9 years and have never had any cause for complaint. James and Allison go out of their way to look after their customers and the accommodation is always spotless. We would recommend it to anyone and, in fact, we always do. The breakfast is second to none ! Quiet at night. Off the road parking facilities. About 8 minutes walk to town centre. Gluten free diets catered for. Abermar is a gem. There are so many B&Bs in Inverness and we've stayed in several, but this one is on the top of our list with one other. The hosts were lovely and we've stayed here at least twice now. Everything is as it should be in a well run, welcoming B&B / Guest House. Walk up the River Ness. So many people are focused on 'shopping', but miss going less than a mile or so up the river and exploring the wee islands on foot and walking back. It's the best part of this small city. As always cannot fault Abermar guest house. Excellent hosts. Breakfast excellent. Will be back again in March. Look forward to seeing James and Alison again. Within walking distance to the shops and local amenities. A good selection of places to eat. This was our 4th stay at the Abermar, no need to look elsewhere, this guest house is immaculate, always have a nice welcome from James and Allison, cannot fault it, very quiet area and just a short walk to centre, no problems with parking, breakfast very good, we will be back, thanks James and Allison for a nice stay. Fabulous! Lovely home away from home. Spoltlessly clean,cosy, comfortable bed. Extremely well run, friendly b & b. Great breakfast. Easy walk from train station. Great value for money. Highly recommend staying here. Loved it. Booked 2 single rooms for 3 nights in Inverness in September 2016. Superb B&B at very good prices. Spacious single rooms appointed to a very high standard. Spotlessly clean with everything you need. Excellent breakfast with full range of cereals, fruit etc. before the main event i.e. a full cooked breakfast :-) Allison and James really helpful and friendly hosts - very keen walkers so able to advise on just about any peak in Scotland. The Abermar also has the added advantage of its own private parking and is just a 5-10 minute walk from Inverness city centre. Definitely one to recommend. Accueil chaleureux, nos hôtes s'intéressent à nous, les déjeuners Sont bons et généreux le matin, fruits frais, suprême d'oranges, c'était SUPER ! A warm, friendly welcome to a homely establishment put me at ease straight away. My room had everything for a relaxing time after a day exploring the delights of the Scottish Highlands - tea and coffee making facilities to refresh the inner being, modern shower room to revive the aching body, fluffy white towels hung on a heated rail and a lovely comfortable bed. A wide range of hot and cold food was available at breakfast, including fresh fruit salad. Traditional cooked items were prepared for each guest, ensuring everything was fresh and hot. Abermar is a pleasant stroll across the river Ness from the town centre and a wide range of restaurants and bars to suit all tastes and pockets. The railway station is a quarter of an hour's walk and is the starting point for the world class journey to Kyle of Lochalsh. Sit on the right hand side for the best views of the run past Plockton into Kyle. Wonderful, spacious room; great breakfast and more importantly great service. Worth more than the current three stars! For those visiting Inverness and not sticking to the standard tours, James has a wealth of information on local hikes, places to see and how to get there in an interesting way. Definitely made our stay special and extra interesting. Lovely stay at the Abermar and both hosts were very accommodating even though I booked at the last minute about 2 hours before arrival! James and Allison could not do enough, including helping get my walking boots dry. The room was very comfortable and the breakfast was excellent, with just a few minutes walk to the shops and theatre I would highly recommend. 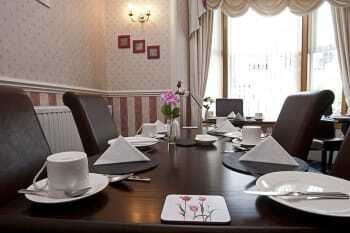 This was a return visit to Abermar Guest House with Allison and James and I can highly recommend it to everyone. They are welcoming and helpful. The rooms are comfortable and clean. The breakfast is cooked fresh with lots of choices. The Riverside restaurant was wonderful - great food, good service. The Phoenix Ale House's carvery on Sunday was great -- good food and plenty of it. The Exchange had great pub food. Loved Leakey's Bookstore. Take a Loch Ness cruise. Visit Cafe Rowan in Invermoriston. A great service, quality of the facility, friendliness of staff, good food. I will write more on TripAdvisor. I preferd to eat in the pub. If you want to mingle with the locals. Very-very friendly and welcoming, with lovely "homey" feeling. Both Alison and Jim are lovely and very helpful. Absolutely superb level of cleanliness! Loved our rooms, even our fussy teenager son was really happy, obviously loving his room too! Excellent breakfast, served on equally fabulous and cosy dining room... Loved every minute there! Would absolutely definitely recommend it to anyone!!! James and Alison are simple fantastic hosts. We hope to return next year. This is the best Guest House we have ever stayed in. you were really friendly and helpful.the breakfast was excellent especially the fruit salad and the ham.the room was nice and comfortable. you should do a picknick at the walk of isles. the velo city cafe is really nice and the food there is tasty.you must visit the loch ness and the urquhart castle. A lovely stay at a great B&B Thanks a lot to Allison and James for the great service and nice mornings in Inverness! Very friendly and felt comfortable. Food excellent. Our hosts were extremely helpful and friendly. Our stay bracketed a hiking trip. Our luggage didn't arrive and our hosts shared their own gear with us. Above and beyond anything one might expect. Provided lots of advice and help on getting around the area. It felt like home. We will be back. This was our 5th stay at Abermar Guest House. James & Allison continue to be terrific hosts - providing yummy breakfasts, & tips on local attraction. The beds are comfortable, the rooms clean & well-maintained. We always enjoy coming back! friendly owners, lovely breakfast, great information and tbh I felt like I cheated them because it was much a good price and the rooms where lovely!! Very helpful hosts, a lovely clean room, very good breakfast. We've stayed at Abermar previously and would do again. A nice friendly guest house wich i would recommend to other visitors to inverness scotland, although we only stayed here for a day and didn't had much time due the fact our flight from inverness airport to Amsterdam was scheduled early we had the change to meet the owners and did had a nice conversation! In the future I will book here again!! Abermar was one of the best experiences we had on our 10 days in Scotland. We arrived exausted and were so pleased with our room, food and hosts we extended our stay. I felt as if we were visiting a cozy and welcoming haven. Jim and Allison are the most wonderful hosts and will aid their guests in finding all accomodations in their wonderful city. I am hoping to return in the future and would highly recommend Abermar as a destination place. We stayed in June with 5 persons 7 nights in Abermar Guest House and had 3 rooms booked. Unfortunately, we arrived very late in Inverness, but this was no problem at all. We have been received a warm and friendly and immediately felt at ease. The house is optimal and to the city center is only a few minutes. All rooms were very clean and very nice. The breakfast was very extensive and tasty. There were no wishes open. The hosts are always ready to make your customers satisfied and have always supported us in our excursions with valuable tips. And so we enjoyed all our vacation there. For this we would like to thank Allison & James. We can recommend this house to anyone and would even hesitate to book there again. Scotland is a beautiful country and we were now for the 2nd time here. Inverness we visited for the 1st time and the city has us very well. Especially its location in the heart of the Highlands, makes them particularly attractive for tourists and nature lovers. There are countless day trips that you can move easily by car. We have, among others visited Fort George, Glennfiddich Distillery (there are still several other Distillerys around), Elgin with Cathedral, Culloden Battlefield, Clava cairn, Cawdor Castle, the Falls of Measach, Inverewe Garden, Dunrobin Castle, Fortrose with Chanonry Point (Dolphins ), Rogie Falls, Loch Ness and Urquhart Castle, Glen Affric, Glen Nevis, Glen Coe, Smoo Cave ..... and the wonderful beaches in Nairn, Durness, Gruinard Bay, Gairloch, Dornoch .... In addition, there are also a lot more to admire. You could spend weeks here and had still not seen everything. For us everything was well worth seeing and interesting. And mention you have of course the beautiful landscape with all its many lakes. No matter where you come back, everything is unique. Finally, I would like to apologize for my not so good english. I still hope that you understand what I mean! Made to feel very welcome. Very comfortable room and excellent breakfast. Able to check in much earlier than originally planned which was a big help. Would definitely stop here again if ever in Inverness and will be recommending this guest house to friends and colleagues. Excellent location for exploring the northern half of Scotland. Everything was fantastic and we will definitely be back. The Waterfront bar at the river was very friendly and the food was excellent. very pleasant and relaxing atmosphere,enjoyed our stay. Absolutely no reason to complain. I was made to feel very welcome and the service and facilities certainly reached expectations. Very pleasant hosts. Nice clean place with excellent breakfast and closed to the city centre. A beautifully decorated accommodation with great breakfast. Excellent dinner at the Waterfront pub, only a short walk away. Such a nice couple,very helpful to us as we had not been to Inverness before, gave good advice on places to visit even moved our belongings when we were out when we moved rooms, l can't praise them enough. A must do is the boat trip on Loch Ness, also go to Channory Point and see the Dolphins. Fort WIlliam is a good day out too. Very nice and friendly. 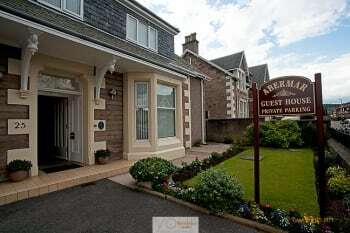 I will highly recommend Abermar Guest House to my friends when planing a trip to Inverness. Everything was perfect! Everything was perfect. Lovely large bedroom, good breakfast, friendly hosts. Will definitely be here again when next visiting Inverness. An excellent B&B very convenient for the town centre yet in a quiet location. Room spotless (if a little small - this was not a problem) with all expected facilities. Breakfast - wide choice, really good fresh fruit, cooked breakfast up there with the best (especially the black pudding!) Recommended! This place was a great place to stay and I would gladly go here again. The bed was comfortable and breakfast was always fantastic! This is a really "GO TO" B&B! 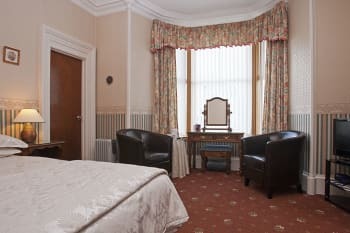 My wife and I are visiting Inverness every year and we always go to Abermar Guest House. Gold for us! James and Allison could not have been more friendly and helpful.we would stay at Abermar any time we are in the area. Definitely check with the vistors information. For tour guides for around he area. Enjoyed a day Culloden and Clava Carins and on Loch Ness. Alison and James are very accommodating, friendly and helpful. The rooms are excellent, quiet and clean. Walk along the path and across the little islands. Food was excellent at the W pub on Huntly Street and at the Castle pub. The cooperative grocery store has good packaged salads and sandwiches to take on a picnic. Friendly hosts who were welcoming and accommodating - fabulous breakfast in clean, fresh and pleasant surroundings - and a short walk from all that Inverness has to offer. An excellent all-round stay. Warm, welcoming hosts, lovely room and breakfast. Would highly recommend this particular Bed & Breakfast. No negative comments whatsoever! This establishment is within walking distance of the town centre and the river Ness. Handy for local restaurants and shops. Even though we were just staying one night, we received a very friendly welcome on arrival and were delighted with the flexibility shown by yourselves to accommodate our other requests. eg. early breakfast, late checkout. The room was very clean and had a comfortable bed. Good size car park at the rear. Location was perfect, only a 5 minute walk from the river. shops nearby. Excellent spotlessly clean accommodation. James and Alison very friendly and helpful. Great breakfast. Rated three stars and could very easily be four. just great. Prompt, friendly, helpful. What more could you ask. Warm, clean, friendly and a good breakfast. Excellent value for money. Very nice stay and friendly service. Some good travel tips from the owner made our change our plans and we're very glad we did. Excellent breakfast! Just returned from a perfect three nights stay. We were made very welcome by the exceptionally friendly owners who obviously care about their guests. Our room was spotlessly clean, cosy and the bed was very comfortable indeed. The en-suite shower room was also spotless with lovely white towels and plenty of hot water. At breakfast there is loads of choice and you won't be disappointed. Now we have found the Abermar Guest House we won't be looking elsewhere when visiting Inverness in the future. The location is ideal, only 5 to 7 minutes walk to the centre of Inverness. We had a wonderful stay. Location was great for walking to shops, restaurants and many historic sights. James and Allison are excellent hosts, and their breakfasts are delicious. If we come back to Inverness we will definitely stay here. Beautiful B&B, warm welcome! It was a pleasant stay, we really enjoyed it! The Abermar is in a good location in relation to the 'city centre'. Approx 15 mins walk from both the bus/rail stations. I found the guest house,clean,tidy,well equipped overall & secure.On a street that's not too busy/noisy. Overall I slept well on all three nights of my stay, most unusual as usually I don't sleep well in other my own bed. The beds are nice and firm too, so no sore backs. The foods on offer for breakfast is wide & caters for all tastes, not to mention generous. It sets you up for your day ahead & believe me, even I didn't need to eat again till supper time. The owners are attentive,helpful & agreeable in nature, decidedly 'people persons'. Inverness is ok, it's in my mind rather touristly & a bit kitsch in places.That said I only stayed as the town/city was a convenient transport hub to go elsewhere. If you like shopping it's great, & has a range of eateries. Inverness is pretty in parts but as a history/archaeology lover it's a bit lacking. However there's plenty of sights/sites to see outwith the town centre,if one does a bit of research & forward planning. I have only one word to sum up my stay "perfect "
Welcoming and extremely helpful hosts. Good breakfast selection. Walk along River Ness relaxing and peaceful. Very kind and friendly host in the Guest House, especially we brought our small kid with us. All the features you would expect with, in addition, by far the best breakfast that we had on our week long trip to the Highlands. Brilliant B&B very friendly and welcoming. Excellent breakfast,décor and cleanliness superb. Ideal position just a short walk to the town. Would recommend taking the sight seeing bus tour. Lots of good restaurants with prices for all pockets within easy reach. James and Allison are friendly and helpful and go out of their way to make your stay a good experience. They will ask where you are going and if you need any information and are happy to give it to you; they will recommend tours, restaurants, routes to drive; shops to visit, etc. There are a number of restaurants within 10 minutes or so from Abermar. Mustard Seed and Nicos along the river, hotels on Church Street and many others. Hop on Hop off bus; Jacobite Tour on Loch Ness, Leakey's bookshop on Church Street. Walking along river to the islands. Checking out the outdoor shops, of which there are a number, to buy some new gear. Visiting the various lovely churches. Checking out the music scene. Alison and James make you most welcome in their home and nothing is too much trouble for them. We most certainly will be back next time we are going up North. Everything was correct. Clean and confortable room, good situation, pivate parking, good breakfast... We were very satisfied of our stay in Inverness. We were delighted with all aspects of our stay. James and Allison are wonderful hosts. The nearby restaurant called The Mustard Seed is a fantastic dining choice. Would be nice if they could do a little bit of variety in their breakfasts. Don't know if that is feasible, but would be a nice touch. Had a realy great stay at the Abermar guest House. The owners James and Allison are lovely people. Would highly recomend staying here. Wihin eight minute walk of town centre. Plenty of eating places to chose from and plenty of things to do and see close by. Cairngorms, Cairngorm Reindeer experience,Highland Wildlife Park,Loch Ness Cruises,Dolphin Encounters and so many more things to do and see. Very friendly, helpful hosts. Breakfast was freshly made and tasted excellent. My room was lovely and comfortable. I throughly enjoyed my stay. Very close to the River Ness, Caladonian Canal and easy walking distance to the city centre. Visit Brodie Castle, and go with a guide. Tony Baxter was brilliant! Book meals early if you want a specific restaurant. Very friendly and kind people, giving us good advice for visits. Very friendly and clean B&B at a fair price. They did everything for us. Never better accommodated. Just missing a garden. Our favourite stay in Inverness. Lovely Guest house. James and Allison are great hosts. Very impressed with facilities. Forget about the Loch Ness. There are better things to do. Very comfortable and spaceous room. Very friendly hosts, we felt really at home. We will surely be returning. We very much enjoyed our stay at Abermar and our hosts, James and Allison, were very friendly and helpful. 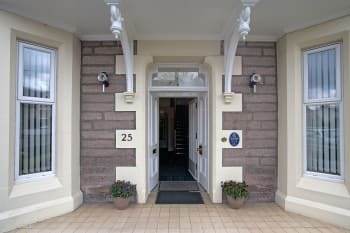 The room was comfortable and spacious; the breakfasts very good; the location superb - easy walking distance to Inverness town centre, the river, shops and restaurants. The Mustard Seed is not to be missed. Aspendos the Turkish restaurant is also very good and the Jamaican restaurant is definitely worth a try! If you're out and about in the Findhorn area to the east, pay a visit to The Bakehouse cafe in Findhorn - wonderful food. Very nice place to stay,friendly owners who were very helpfull and made you feel "at home" , excellent choices at breakfast, plenty to choose from !! Very friendly owners. Nothing too much bother. Will stay there again next year. Lovely comfortable beds. Had a lovely stay and we are hoping to return again soon. A very enjoyable stay, excellent breakfast and very friendly welcome by Allison and James. If it wasn't such a long journey for me, I'd definitely be back next year! For those with an independent means of transport (I wouldn't recommend using the bus! ), the Tomatin distillery is well worth a visit. Have rated all above at the highest as this is what it was. Would have no hesitation in making a return visit.One of our main reasons for using Guest House's is meeting so many nice people at breakfast,from far and near and Abermar certainly gave us this opportunity,including the Host/Hostess. What a lovely guest house, from onset the house and garden are immaculate . A warm welcome from Alison and James inviting you into their 'home' which is first class. Lovely breakfast selection too. Both my husband and I thoroughly enjoyed our stay. A really nice and peaceful place. We slept great here! The breakfast was also really good (kept us going for many hours!) and the hosts catered to vegetarians as well. Can't think of anything negative to say. There are lots of great places to enjoy a pint of real ale in Inverness. It's not a long walk to these from Abermar. Lovely b n b with everything you could need. We loved the walk along the river. Inverness is so pretty but there isn't a ton to see or do. We were warmly welcomed, very comfortable homely atmosphere. Just got the feeling that nothing was too much trouble. When I asked for local taxi number this was no problem and Mr Mackay even offered to call on our behalf which I declined but appreciated the gesture. Directions given to find the Guest House were spot on and not overly complicated which is important when your not sure where your going and do not use sat nav. Given good directions how to get into town, with some good local restaurants pointed out. Strongly recommend a trip down Loch Ness very relaxing and a great way to take in the shear beauty of the place. We really enjoyed the big variety of the breakfast: from continental to typical Scottish. Keep it up! Very nice place, nice folks and very good overall. My wife and I enjoyed our stay at Abermar immensely. The room was comfortable and well-appointed. The breakfasts were excellent. Mr and Mrs Mackay were first-rate hosts, welcoming and friendly. Top marks all round. Top notch! I had a great stay: the rooms are well equipped, the showers are warm, and the WiFi is good. The location is also very central. My breakfasts were great and I particularly recommend the scrambled eggs. Everyone is so friendly and helpful- was a pleasure to stay here. I was working at the theatre and had colleagues staying closer to the theatre- and I thought maybe I'd made the wrong choice- but my colleagues were not as happy as I was in the Abermar. The only issue was the kettle in the room- sometimes it didn't stop boiling and became very hot- but if this was replaced it would have been perfect! The room was spacious, bed was comfortable, and the bathroom was clean and also spacious. We had to leave at 4:30 am one morning and the owners kindly packed a bagged breakfast for us. The downtown area (main tourist area) is a bit of a walk, but it wasn't a bad walk at all in our opinion - straight down the road and a footbridge over the river. Staying a little farther away and walking helped us keep to our travel budget. Friendly and welcoming hosts. Excellent room (comfy bed, good facilities, spot on cleanliness) and good breakfast with plenty of choice. Go for walk along the Ness till you reach Ness Island. Enjoy the authentic Scottish life in one of the many pubs that offers live music. James and Alison were so friendly and knowledgeable. Little touches like having umbrellas available to use, beautiful fresh fruit salad at breakfast and suggestions for places to eat were very much appreciated. Would recommend them for long and short stays. Good value and actually cheaper than some we stayed at which were not half as good. 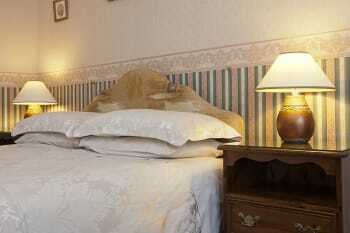 Lovely B&B centrally located within easy walking distance to town, restaurants and main roads in and out of Inverness. Book your restaurants if you can as always busy. Would recommend The Mustard Seed (free drink too if staying at Abermar) and The Room. Both different, both very good. Make time to see The Clava Cairns and Cawdor Castle. You won't be disappointed. Owners extremely hospitable, nothing too much trouble. Would highly recommend staying here. we had a great stay at Abermar Guest House, conveniently located in the city center, with parking facilities. we liked the room, the bathroom and the inclusive breakfast, which was more than what we could possibly eat. Inverness is a charming small town and Abermar a good place to stay at a great price/quality ratio. lots of fun with experience4x4.com; if going out to dinner, do it early, before 20h. we walked the entire city center looking for a place to eat around 21h we found one with closing time at 22h..
Avoid the cool runnings Jamaican restaurant. Fabulous place to stay. James and Alison are a lovely friendly couple who run a very good establishment. Inverness is a brilliant city to stay and visit. The B&B is situated on the quiet side and within easy walking distance to the town centre. The staff were extremely friendly and efficient. Breakfast was tasty and there was a wide range of fruit/cereals/beverages/ cooked foods. Abermar is within easy walking distance of the city centre, so staying here is convenient, especially as there is parking provided. All in all we really enjoyed our stay and it is very good value for money. You can walk to the city centre within 5 minutes, and Abermar is close to Eden Court (the local theatre) and the River Ness where there are lovely walks. Hotel correcto, buena relación calidad precio. Anfitriones encantadores. Very close just across the bridge to town centre for places to eat. The welcome was warm and friendly. Was working in Inverness enjoyed our stay. James and Allison very nice people. Good breakfast will definitely stay again. Excellent bed and breakfast very clean and comfortable and a great breakfast . A great place, so warm and comfortable. Really good breakfast, plenty to eat. Thank you. Everything was perfect. We had a very good time at your Guest House. Thank you for your hospitality. Hosts were very nice and helpful. They gave ideas as to what to do and where to go. The rooms are large and nicely taken care of. The breakfasts were delicious, and served with a smile. The river walk down and across the islands is lovely. Hootenannies is a great place to eat (try the salmon), and they have music ever night about 9:30. Going on the Loch Ness Tour was fun and informative, as was the castle. pleasant room,and good breakfast.Friendly hosts. A lot of information about things to do,local transport etc is available from the tourist office. Room is very confortable, good breakfast and walking distance from city center. James and Allison were excellent, warm and friendly hosts. We couldn't fault a single thing about Abermar Guest House. It was in the perfect location, just a short stroll from the city centre which made is so easy to get around. We will certainly consider staying there again and will definitely recommend this B&B to friends and family. The Tourist Information Centre is second to none. The staff were brilliant in helping us with bus times and local knowledge. There is a lovely walk along the River Ness to Ness Islands and the city is so easy to get around on foot. If planning to dine out on a Saturday night book ahead as the restaurants are busy. The Riverside Restaurant in particular is a must, you will have the best meal of your life. Oh, and Inverness Bus Station is the starting point for some beautiful journeys to some amazing places! ery comfortable, no surprises, quiet, frindly host. Excellent for parking which can be a problem at other places. We had a fine stay at Abermar. A good place from which to travel to Loch Ness and Inverness. We had a good meal in The Mustard Seed on the Ness-bank. Bien situé, nous avons eu un bon accueil, personnes très arrangeantes. Wonderful place, lovely hosts, beautiful town. Would stay here again anytime. Very helpful and friendly staff good location, quiet very clean (I rarely take a bath in hotels/b&bs due to lacking cleanliness - here I did!) very good breakfast: good choice and fresh fruit salad and natural NON-LOW-FAT (and therefore healthy) yoghurt big comfortable bed still expensive (but that's just all over Scotland in high season...) ++ Tesco, Aldi and Spar are very close; we were tired of going for lunch/dinner (+ spending so much money on it as well) and that helped us a lot! We really enjoyed our stay - everything was perfect. Very kind hosts, nice room and good breakfast. To be able to walk to the center of town was superbe !thanks a lot for all !! Excellent place to stay in Inverness. House was spotlessly clean and very comfortable. Very pleasant and helpful couple. Would thoroughly recommend. We ate at Waterfront restaurant just five minutes walk away. It was excellent. An excellent option if you visit Inverness. you were lovely people and room was fantastic thanks for my short stay. We all thoroughly enjoyed our stay, excellent hospitality and great breakfast with high quality ingredients! Quiet location within walking distance of town centre and Caledonian Canal. Private parking lot and outstanding hospitability. Best restaurants in town: The Mustard Seed, The Kitchen Brasserie, reservation mandatory! I was greeted with a very warm welcome on arrival by Mr. James Mackay whom along with his wife Allison were very friendly and helpful throughout my stay.The actual guest house throughout was so clean and fresh it was a pleasure to stay. The choice at breakfast was also good. Would definitely stay again and recommend to friends. Local restaurants and pubs serving good food are in abundance. I ate at The Castle Tavern and Bar 27 which are both in Castle Street,both serve Real Ale.There are also Italian, Indian, Chinese and straight forward restaurants. Places that i visited in my 4 days were Kyle of Lochalsh,Fort William,Mallaig and the Isle of Skye.Which ever direction you leave Inverness from the scenery is stunning. Logement et accueil excellent. Bonne situation géographique dans une avenue calme avec à proximité des arrêts de bus permettant de se déplacer facilement sans utiliser son véhicule. Beautiful guest house in convenient location. Would definitely stay again. Most enjoyable 4 day stay. Excellent hosts and hospitality. Convenient to City Centre with a rural feel. Mustard Seed and Kitchen Restaurants are a must, but book early to avoid disappointment. A visit to Foyers on the South side of Loch Ness through Dores. Loved our stay. Very clean and excellent service. This is our 3rd stay and if back in Inverness will stay again.great room, great breakfasts, and fantastic hospitality. Absolutely no complaints. Smart, clean and spacious accommodation and a great breakfast. The guesthouse is just a short, scenic walk across the river to town, and the hosts are friendly and helpful. If you have time and it's a pleasant day, get to the river and turn right and walk along it. After ten minutes you'll get to the Ness Islands. Peaceful and beautiful. Very friendly welcome. Room spacious, spotless and very comfortable. Wide selection of breakfast food to suit all tastes. Would certainly return and recommend to friends. Excellent in every way: location, cleanliness and James & Allison are wonderful hosts. Very helpful and friendly staff. Easy level walk to town. Loch Ness - Foyers Falls. Clava cairns. Lovey Hosts, Lovely House and the best place to stay in Inverness by far. Breakfast is amazing. Would thoroughly recommend this guest house. Great location for all the entertainment plus eating out establishments. Fantasic choices. Why would you go anywhere else ! A great stay in this lovely place and a particularly warm welcome,we felt at home as soon as we arrived .Many thanks to Allison & James who advised us as to where to dine and what to see around Inverness.We will come again for sure! Very friendly people, rooms were lovely and bright and the breakfast was great with plenty of variety. Ample parking which is great. We tried the Beefeater Inn this time for the first and we all enjoyed a lovely meal. We also enjoy going to the garden centres where you can get a nice lunch or a cup of tea and a cake if that is all we want. Perfect location and the breakfast was amazing. What a lovely place! After a friendly reception we were given quite a bit of useful information about Inverness. Once we arrived in our room we found it to be nice and clean, containing a comfortable bed and a spacious bathroom with a good shower. Breakfast was very well cooked and thoroughly satisfying. The favourite place of our trip, really friendly people and giving good advices, beautiful and clean room, marvellous breakfest and close to the city center. We thoroughly enjoyed our four day stay here as Abermar provided everything we could possibly need, even down to the delicious packed lunch Allison provided for our 9hr train journey back home. The Castle Inn was a delight if you enjoy a delicious pint of real ale with views overlooking the Castle and River Ness. Wonderful circular walk along the River across Ness Island to the beautiful Botanic Gardens with Cafe and then back into town. And just a short walk from Abermar at the end of Fairfield Road is the Caledonian Canal with a lovely walk out to the sea. The 3 hr train journey from Inverness Station right across from East to West ( the narrowest part of Scotland) to Kyle of Lochalsh was delightful and to stop off at the beautiful town of Plockton was a fantastic way to spend the day. Top value for money. Room and board include every feature we could hope for. Hosts completely charming. Location good with a very short walk into Inverness town centre. Very much enjoyed dinner at The Mustard Seed. i would highly recommend to hire a car. so it`s possible to see the attractions from a low distance and it`s awesome to drive through the highland roads. sorry, but i am not very good at writing and speaking english. Quiet central location with plenty of off-street parking. Lovely rooms, great breakfast and a friendly host. Highly recommended - would certainly stay here again. James and Allison made us feel most welcome and couldn't have been more helpful. They accommodated our special dietary requirements with ease. The choice at breakfast was great and we left full. The room was a good size and the bed very comfortable. A very nice place to stay and would definitely stay here again. one of the cleanest and best run guest houses we have stayed in. rooms were ( or certainly the one my wife and I had )were very roomy plenty of space for bags etc. tea/ coffee making facilities available in the rooms along with biscuits all very welcome after a hard days sightseeing. The two owners very helpful and happy to chat with you in the small amount of spare time they must have given the cleanliness and good state of décor and repair of the rooms. could not rate ABERMAR highly enough. Town only 10 minutes ( at most ) walking distance have a good look around for good restaurant's plenty available if all else fails a Witherspoons is available in the town for reasonable food at a reasonable price. out of town Visit Culloden. see Urquart castle and fort George all played ( play ) a large part in the history of Scotland even if most of the staff and guides do not hail from Scotland never mind the Highlands. This is not an attack on people from outside Scotland just feel that the stories tales etc lose a bit of authenticity. My third visit in recent years. A very high standard facility with a big welcome. An ideal location situated within easy walking distance of the city centre. I use it as a base for touring the Highland railway lines. The accommodation is very comfortable and, most important of all, is spotlessly clean. The shortest walk to the centre is over the pedestrian River Ness bridge. A great and bracing start to the day. Excellent. Probably the best Bed & Breakfast in the whole of Inverness. Hosts are very friendly and engaging with guests. The property is exceptional and extremely well maintained. Would have no hesitation in recommending this 5 star accommodation. Great parking facilities to the rear of the house. Leave your car there for the duration of your stay. We would recommend the Restaurant 27 Castle Street in the city and the Dores Inn on the banks of Loch Ness. These are so popular you'd better check out their website and phone ahead to book. The retail outlets in Inverness are on a par with the rest of the UK. Inverness is certainly the capital of the Highlands. Great location in relation to town centre. Clean, warm accommodation with lovely food and hosts. We enjoyed 4 wonderful nights at Abermar Guest House and had a very pleasant experience. It proved to be an excellent location for walking into the town and for exploring the wonderful countryside surrounds. We found not only the accommodation excellent but the hosts as well. Valuable information was received from hosts regarding our upcoming tour and a fantastic cooked breakfast started the day. No hesitation in coming back again. The couple who run it are very nice and accommodating. As I go there quite frequently it feels like home from home. Very friendly without being intrusive. 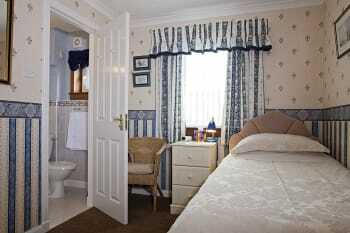 Lovely clean comfortable room with plenty of electricity sockets, milk for tea and extras like tissues. Had a lovely meal at The Corner in Inverness. Good value and good food. This is our 2nd stay her and it wont be our last. Rooms are spacious and spotlessly clean. Breakfast really sets you up for the day with the selection on offer of fresh fruit,cereals, porridge,yoghurts etc,then to follow a fantastic Full Scottish Breakfast with as much tea and toast as you can manage. Owners of guest house are lovely also and make time to talk to guests. Free wi-fi was a plus point for our teenage daughter. Only wish we could have stayed longer. 10/10. Eden Court theatre had a varied programme on when we were there from ballet to cinema. Town centre is a 10 minute walk from guest house. Hootenanny's bar is great for traditional music. If you turn left when you you come out of the Abermar and walk for about 10 minutes you come to the canal where you can see boats going through the locks. The walk along the river is lovely also. Even though it was just a short stay, I enjoyed it very much. Allison and James are such caring people and I felt very comfortable staying there. If I should happen to be in Inverness again, I will definitly stay there again. Try out the magnetic knives and forks at Zizzi's italian resturant! this is a gem in the heart of the highlands. James and Allison are very helpful and friendly. The guesthouse is spotless and bright. It is very convenient for the town just a nice stroll over the pedestrian bridge. Breakfast was really tasty especially the black pudding. I would recommend the Abermar to anyone who wants a great place to stay. jump on the cromarty bus and check out the dolphins at Fortrose and North Kessock and the huge rabbit population at the castle. Exceptional room and bath. Very pleasant hosts. Book ahead for dinner on Saturday night. Restaurants in Inverness fill up quickly then. Another lovely stay, home from home with the added bonus of a lovely cooked breakfast - and nothing to do but enjoy it! Great location, close to loads of great restaurants and places to visit. Off road parking and a great base for all that Inverness has to offer. Short but very nice stay! Nothing to complain. Very well located, close to the city centre. You have to have dinner at "the Mustard and Seeds". Very friendly hosts. Made me feel very welcome. The room had all I needed and was always kept clean. Breakfast was very good. The Abermar Guest House was delightful! Our hosts couldn't have been nicer, and so helpful with suggestions about what to see and where to eat. Our twin room was sparkling clean, spacious and quiet. Breakfast was delicious. We would definitely stay again! Good location, lovely bedroom + en-suite, delicious breakfast and excellent hospitality we thoroughly enjoyed our visit. Very friendly staff and good location ! Cleanliness, nice atmosphere, wonderful breakfast with fresh fruits, a short walk to the city centre. Highly recommended! Great hosts, great food & the rooms a great size.Would recommend to everyone. Would stay again if in this part of the world again. Very very friendly people who run the B&B,nothing is a problem for them. We enjoyed every moment of our stay. To many things to see and do from History to modern pubs and entertainment. to much to list here. Great breakfast. Homemade raspberry jam was yummy. Room very clean and comfortable. Tea/coffee facilities in the room were good as plentiful supply of milk sachets (unlike many places where there only seem to be enough for one round of drinks! )and nice biscuits. Close to the town centre - pleasant walk. Parking available. Best stay in a while. Comfortable rooms, excellent breakfast, friendly and helpful owners. Within easy walking distance from town center. Plenty of places to eat within walking distance.There is something for every taste and budget. Everything in the room was nice and Well-prepared, together with a very friendly family to receive you. We will recommend it to everybody going to Inverness. Extremely friendly atmosphere and very helpful to myself and children in advising where to visit and what amenities were close by. Great place to stay. Very clean and room was wonderful. Very easy to travel to all places of interest within the Inverness area. Best B&B out of the 4 we stayed in on our holiday. Comfortable, clean, great breakfast, plenty tea bags etc. in the room. Would happily stay again. Warm, friendly welcome. room clean and good size. breakfast was excellent. Alison & James always prepared to stop and chat. We ate out every night and can recommend The Room on Queensgate (ate there 3 of the 4 nights we stayed)and if you like Indian food go to The Rajah. Excellent service and food at both places. Ideal location with easy walk to town Centre and hassle free driving to tourist locations. Large room, comfortable bed and great shower. Nothing was too much trouble for our friendly and helpful hosts. This B&B has everything. Highly recommended! Nos hôtes étaient très sympathiques et le petit déjeuner était parfait. La chambre était très jolie et le lit, très confortable. Vraiment, rien à redire ! My husband Alistair and I have stayed with James and Allison many times over the years and with our friends. They are a very friendly hospitable couple, who run a fantastic B&B. You are less than 10mins walk away from the town centre of Inverness. On the B&B side of the pedestrian bridge there is a nice quiet pub and a eating place called the Waterfront and there are other places to eat too. Over the bridge lots of shops and restaurants, like Italian etc. There is Eden Court Theatre and a lovely walk along the river. Very welcoming, great choice of breakfasts and only a short walking distance from the centre of town. We stayed for three nights and would definitely recommend you. We were pleasantly surprised by a card and a bottle of cava on my wife's 60th birthday. Great stay. We ate at the Mustard Seed on Fraser Street, very good food but a little expensive, Great atmosphere but book to be sure of a table. Best guest house I've stayed in for a long while! The Rajah Indian restaurant in Inverness is really excellent - a must visit. great and very helpful, always pleasant lovely clean room, and a very good breakfast. Anything you wanted to know Allison and James were always happy to help. Being a avid bird watcher and photographer they were always more than helpful in pointing out places to visit. there are lots of really good places to eat in Inverness both restaurants and pubs.